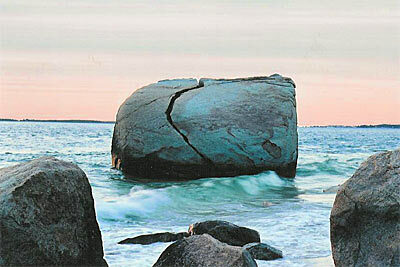 Split Rock is a large, natural middle-split rock in the shallow waters off what is called Makonikey Head on the North Shore of Martha's Vineyard Island. It is just a few yards out from the shoreline, where the waves wash against it and the sharp, jagged split in the rock allows the sunset to shine through if you stand in exactly the right spot. It is reachable on foot from Lambert's Cove Beach, though most of the land on the bluffs above is privately owned. It is easily visible by boat and is actually a marker for some deep fishing holes towards the Elizabeth Islands where large striped bass like to hang out. Peter chose Split Rock for his company name because he has always admired its steadfastness and distinctive character. He lives near this unique landmark glacial boulder and believes it is apropos of his company model since he splits “The Rock” between buyers and sellers clearly separating the two and only working with buyers. Pulpit Rock is in the Farm Neck area of Oak Bluffs, off County Road going toward beautiful Sengekontacket Pond. It is famous as the 'pulpit' on which John Sanders preached Christianity to African-American slaves (yes, there were slaves here on Martha's Vineyard) in the late 1700s. The MV Heritage Trail site has more information. Lovers Rock, also known as 'Moon Rock', is across from the Seaview hotel (now condos) in Oak Bluffs, but was buried by the town beach project in the early 1900s. In its day it was a popular spot for young lovers to watch the moon rising from Nantucket Sound. It was also a spot for youngsters to try their first dives. When the beach project was first proposed, a cry of protest flew because Lovers Rock would be covered by tons of sand. The town engineers pointed out that the rock was so big it could not possibly be moved and natural erosion will expose the rock in time, which is probably true. A flat stone near the Inkwell Beach jetty marks the spot of Lovers Rock, and you can watch the moon rise from there -- and it's still very nice. John Belushi was a beloved comedy writer, blues musician, and actor of the 1970-80's. He got his start in National Lampoon's off-Broadway "Lemmings", and subsequently participated in future National Lampoon projects, including its syndicated "Radio Hour." In 1975, he was one of several Second City Comedy Troup in NBC's new satirical revue program "Saturday Night Live". Among Belushi's celebrated comic creations were the fish-out-of-water Samurai warrior; the "cheeseburger cheeseburger" short-order cook; and -- with close friend Dan Aykroyd -- the ultra-hip Blues Brothers. He is possibly best remembered for his character Bluto Blutarsky in "Animal House", a hysterically funny take on the 60's frat house scene. "The Blues Brothers" are credited by many blues musicians for rekindling an interest in blues music and many forgotten artists. Belushi came to the Vineyard during his early 'Saturday Night Live' years, finding peace and quiet, and purchased a home in Chilmark with his wife (whose name we'll leave out for her privacy because she still lives on Martha's Vineyard). The meteoric rise and fall of Belushi was the stuff of which legends are made, juggling his brilliant comic gifts against his drug use and death by overdose. He was buried off of South Road in Chilmark at Abel's Hill cemetery, whereupon hundreds of fans would come to hold vigils and party, leaving mementos like 'Blues Brothers' albums, beer bottles, and frat pins. While John's body was moved to another undisclosed location, Belushi's Rock stayed and still brings visitors who loved John and to remember the laughter he left with them with. Waskosism's Rock and "Middle Line" were boundaries that divided Wampanoag land from Mayhew land for about ten to twenty years. Middle Line was a straight line drawn from Waskosim's rock across the Island to Menemsha Pond. Looking toward Menemsha Pond, the land on the right was Wampanoag and the land on the left was Mayhew. Today, Waskosim's marks a different boundary between the towns of Chilmark and West Tisbury. Waskosim means "new stone" in Wampanoag. You can find Waskosim's on a hike in the Land Bank reservation, which is beautiful woodlands and natural grassland vistas, marked by sign on North Road in Chilmark. The north shore of Chilmark remained Wampanoag land far longer than the towns of Noepe on the south shore. Great Rock Bight was owned by Aquinnah Wampanoag Elisha Amos in the mid-1700s. When Amos died, his estate was turned over to his wife Rebecca, who had been brought to America on the Middle Passage and had been a slave on the Bassett Farm in Chilmark (now the Captain Flanders Farm). Also a Land Bank Preserve, walk to the North Shore and swim! Rocks, Rocks and more Rocks! I think everyone loves Rocks. My name, Peter, means The Rock according to the Bible. I consider the name of my company, SplitRock Real Estate, to be a metaphor for splitting the Rock separating Buyers and Sellers. 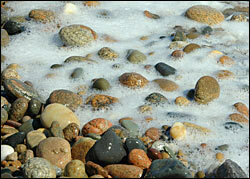 Did you know Martha's Vineyard is often referred to as The Rock? Anyone who has ever visited the Vineyard has most likely found that special rock. I have hauled hundreds of pounds of special rocks up from the beach in my pockets, wrapped in towels, in large buckets, by wheel barrow and in the back of my car during the forty plus years I have been on the Vineyard. I remember when I was a boy, I tried to remove all the rocks on the beach in front of Split Rock, and I could not understand why more rocks returned the next day to replace those I removed. I have special rocks around my gardens, and I covet what few rocks remain in the ancient stone walls around my property. I have an obelisk shaped rock as my property sign marker. My neighbors refer to it as "Fyler Rock". I painted my street number boldly on another large flat rock. I use rocks as paper weights, door stops and ornamental sculpture on the mantel in my home. I see many Islanders driving around with rocks covering the top surface of their car dashboards --- not sure how safe that is. People paint all kinds of graphical images on rocks, or etch short slogans into the stone. There is a belief that rocks with circles on their surfaces signify good luck. Phillip A. Long, an artist living in Virginia has gone even further with his passion for Rocks; he creates one-of-a-kind one time sculptures using different varieties and shapes of rocks he lovingly and thoughtfully collects from our Island beaches during his precious yearly pilgrimage to Martha's Vineyard. His sculptures evoke joy, whimsy, tension and awe as he skillfully combines and balances rocks into simple and masterful creations. He then photographs the sculptures to preserve them in a two-dimensional format. Take a look at some of Phillip A. Long's work and I think you will agree, Vineyard Rocks is something special, and so is the magical Island that spawned them. CLICK HERE if you have information on other famous Martha's Vineyard Island Rocks you'd like to share? I'd love to hear from you.